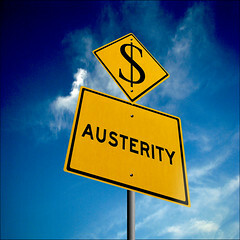 Who gave us the old-fashioned austerity? It’s good enough for them, but not the 1%. I accuse the Current Leadership of the GOP (CLOGOP) of knowing better when it comes to the austerity they want to impose on the country. They know that Keynesian stimulus works to boost employment and GNP. The GOP has used stimulus repeatedly in the past to win elections when they were in power, and they followed re-election with a mild recession to offset the previous stimulus. They know it works. Herbert Hoover did not know it worked, and austerity in the 1930s made the Great Depression longer and more severe. 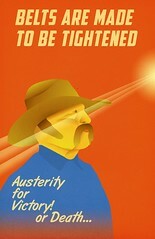 Now the CLOGOP are using the threat of more austerity to prolong the Great Recession for political gain. They don’t care about the suffering of Americans losing homes, jobs and access to health care. They intend to punish us until we vote to return the GOP to power in Washington, DC. The Great Recession is only an inconvenience to their masters, the 1%. The stock market is at record highs, reflecting the state of mind of the 1%, who own most of the stock. The GOP are peddling austerity as a means to promote job creating confidence in the business community. They believe that Germany and Europe are on the right track and want the US to join them. All the austerity-produced confidence in the world will not produce any jobs if you and I lack the income (purchasing power) to buy what business is selling. Confidence and $5 will buy a burger and fries; confidence alone will buy nothing. A true leader leads from the front, not from behind the lines. Now that he has the nomination sewed up, it is time for Mitt to show us what his administration would look like. He intends to give us austerity per the Ryan budget. I disagree with the prescription that the 1% gets tax cuts while the rest of us share the austerity. However, if that is what Mitt wants, then he should lead the way. He can start by refusing the President’s salary, he doesn’t need it, and he can pay for some of the perks of his office. Mitt, it is time to stop trying to be all things to all men/women, and start showing some leadership. Being President requires more than looking presidential.